Great painting of your paints. Yes please clean your palette, I do not know how you get such clean colours working from it. Other people's supplies are endlessly fascinating! And thank you for sharing your process - I too had wondered how you went about a painting. I like the combination of graphite and w/c - it seems to result in a nice painterly look. At least, when you do it! Wooooooohooooooo! Thank you so much for this fantastic post. I didn't know Van Gogh were student grade paints and I wouldn't have guessed looking at your sketches. Love your quick demo and looking forward to a step by step version of your next sketch. Thanks so much for this, Debra. 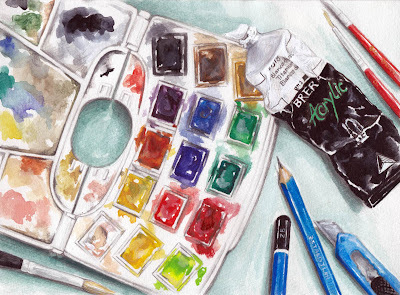 I love the sketch of your paints. I didn't know that Van Gogh paints were student grade either. You certainly do some great work with you student grade paints! Your work is always amazing and so enjoyable to look at. just shopped for gel medium today and almost croaked when i saw the price. Wow and dang! Every time I come to your site, I am blown away. I LOVE this! Perfect colors. wow, that's really insightful about your processes. no wonder your pieces are so delicate and detailed, there's so much love and care in the procedure. And very very useful post, Debra. If you're getting this quality of painting from student grade paints, imagine what you'd get with artist grade. In my opinion, the clarity of color and translucence is what comes with artist grade paints...have you considered mail order? You could start with a warm and cool primary collection which would only be 6 colors...I can't stress this enough...you'll be amazed at the difference. This is a case of "you get what you pay for."